This year's International Week of the Deaf is set to kick off on September 23. This week celebrates all things deaf culture and promotes the creation of an accessibility in mainstream culture. In the spirit of the International Week of the Deaf, let's explore Deaf Australia's Deaf Friendly Scheme, and how they're promoting Deaf Friendly businesses and sign language. The Deaf Friendly Scheme is "Deaf Australia's tick of approval for organisations that employ deaf people and are accessible to deaf people". This is a web of businesses, employers, and employees who network together, seeking to promote practices of accessibility. If you have employees, or are an employee who can use Australian Sign Language, you can take hold of this unique networking opportunity. The main advantage to any accessible business is the expanded clientele. With greater access to the deaf community, the Deaf Friendly Scheme helps Deaf clients find your services more easily. More and more businesses are now catering to deaf accessibility. 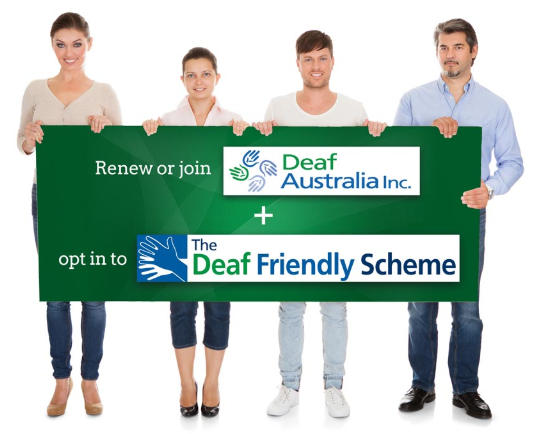 Deaf Australia offers a range of services, promotions and accreditation based on the price range of membership. From certificates, Auslan Reference checks, and even branded advertisement, there are numerous benefits for any business looking to gain membership. Deaf Australia has a variety of membership offers and deals, especially to those who are already proficient in AUSLAN. want to be a part of the Deaf Friendly Scheme and would like to encourage your employer/organisation to become involved.